River birch seedlings and trees for sale. A Birch native to the eastern half of the US on river bottoms, but grows well in many soils. Great heat and cold tolerance. Reddish-brown exfoliating bark. 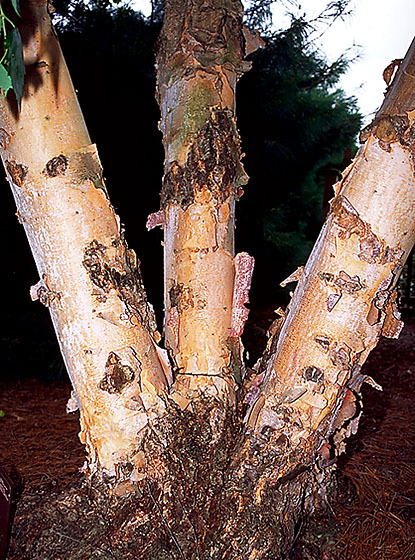 River birch is resistant to the bronze birch borer which attacks most other birches but aphids are common. While showing some aphids on a birch leaf to the state bug inspector last summer we were amazed to see the aphids scooting fast across the leaf being chased by a ladybug, ah but I digress.... River birch can grow 40 to 70' and spread 40-60'. All birches are somewhat short lived trees as compared to a Maple. It can grow quite fast given enough fertilizer and water. 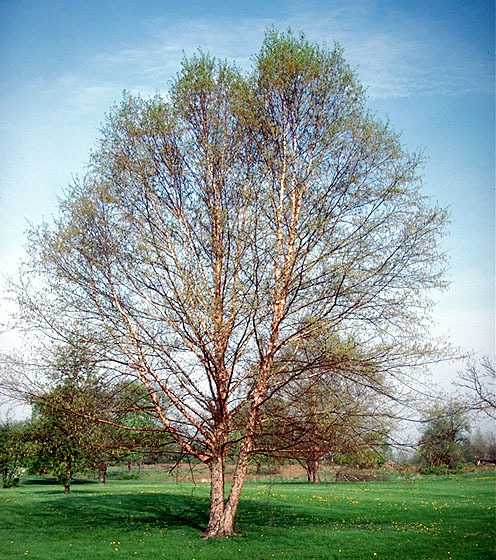 As true with most birches, River Birch will drop the inner leaves when stressed by drought. Hardy from zone 3 to 9. The seeds are in a catkin about 1" long and drop the seeds in the spring which can be quite annoying when working in rows of river birch. They can be propagated fairly easily by softwood cuttings. Prune in late summer or fall as sap will run with spring pruning. One can actually make syrup out of the sap of birches though the sugar content is lower than Maple sap. On my trip thru the Midwest this spring I noted the wild river birch growing along the Mississippi river in Illinois. To my surprise I found the mature trunks on the river birch to be quite plain and possibly downright ugly for a tree that starts out so beautiful. The bark takes on a maple like look. To buy river birch seedlings or transplants click the blue link below. To order River Birch by PHONE: We're glad to take your order by phone. For your convenience, we have a toll free number 800 568-9179. Phone orders can be charged to VISA, American Express or MasterCard accounts.